An AES Wastewater Treatment System has participated in Trials 12 and 13 at OSET-NTP Rotorua. The certificates are available below. Trial 12 mirrored international testing results with the AES-38 system as achieving very high levels of secondary advanced treatment and Trial 13 proved the effectiveness of Nitrogen reduction by recirculating through the septic tank, and achieving very low E. colilevels with the addition of a gravity UV disinfection unit.. Environment Technology (ET) installed an AES system at the Rotorua OSET-NTP facility in Trial 12 which ran from October 2016 – July 2017. 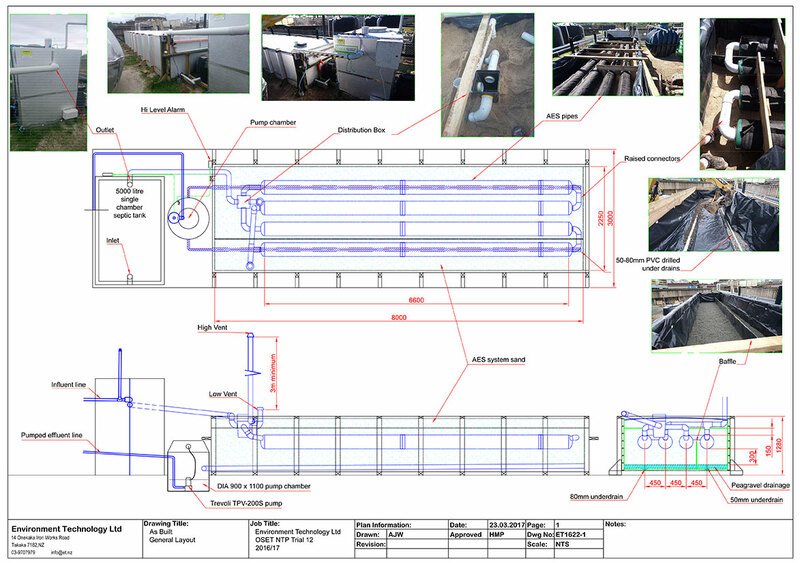 The Environment Technology Ltd AES-38 passive aerobic proprietary trench treatment system tested achieved the following effluent quality ratings over the seventeen benchmarking results in weeks 20 to 35. AES thus meets the secondary effluent quality requirements of AS/NZS1547:2012 at the test flow rate of 1,000 L/day (ie at 97% of the plants advised design capacity or a loading rate of 37 L/m of AES pipeline/day). The AES system continued with some modifications as an AES-38 R/UV through Trial 13 which ran from November 2017 – August 2018. Treated effluent was recirculated back through the carbon rich and anoxic zone in the base of the septic tank to reduce nitrogen. A Salcor 3G UV unit was also included for the second half of this trial to further reduce pathogens. 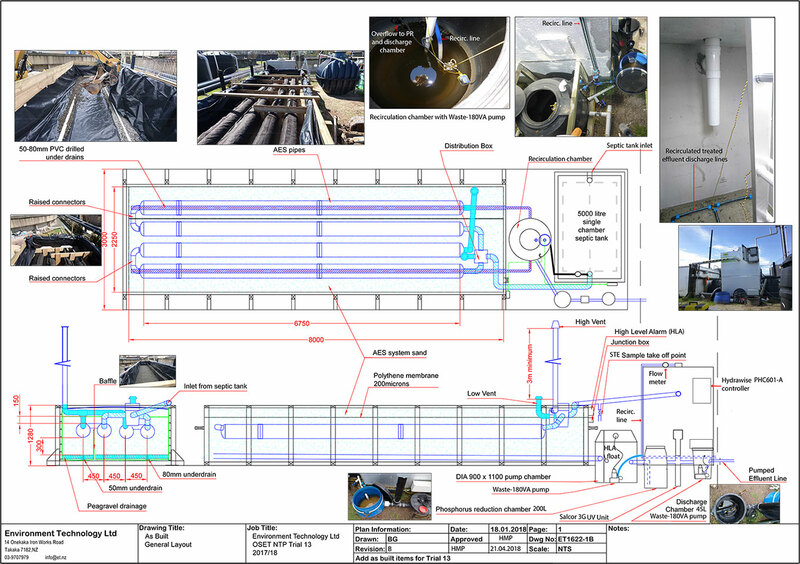 The Environment Technology AES-38 R & R/UV treatment plant had 100% of BOD5 results and 100% of TSS results within the Secondary Effluent Quality requirements for both the 90 percentile and maximum limits above and therefore achieved AS/NZS 1547 secondary effluent quality performance requirements when operated at 1,000 L/day. In terms of effluent quality, the Environment Technology AES-38 plant performed consistently well overall, with low and stable BOD, TSS, and TN results throughout. There was no impact upon performance due to varying influent concentrations, cold winter temperatures, or the high flow test. Overall, the plant achieved total nitrification with no NH4-N throughout, and low levels of TOXN, resulting in low Total Nitrogen of <12mg/L, and a mean of only 7.8mg/L. Bacteria reduction was also good, with the AES-38 R plant effluent containing 1,900-18,000cfu/100mL faecal coliforms. After the UV unit was switched on in Week 20, low E.coli results were achieved with a median of 2cfu/100mL and 80% <3cfu/100mL. The Environment Technology AES-38 R/UV plant therefore had 100% compliance with the requirements of AS/NZS 1547 for secondary treatment plants with disinfection. Contact us for further information and for design help with your situation. Click on the image below of the AS-Built Diagram to enlarge.